Kenneth R. Demarest was born in Hackensack, NJ, on December 16, 1952. He received the BS. degree in electrical engineering from John Brown University, Siloam Springs, AR, on 1974, and the MS. and Ph.D. degrees in electrical engineering from The Ohio State University, Columbus, in 1976 and 1980, respectively. From 1974-1979, he was associated with the ElectroScience Laboratory at The Ohio State University as a Graduate Research Associate. From 1979-1984 he was an Assistant Professor in the electrical engineering department of Lafayette College, Easton, PA. 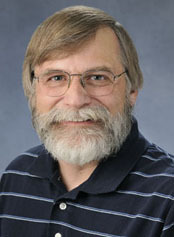 Since 1984, he has been with the electrical engineering and computer science department at the University of Kansas, Lawrence, most recently as a Professor. His research interests are in the areas of fiber optic communications and electromagnetics. His work in electromagnetics has centered on the development of computational techniques for determining the electromagnetic scattering of moderate to large objects. These techniques have been variations of the Method of Moments and the Finite-Difference Time-Domain technique. His work in fiber optic communications has centered on high speed, wavelength division multiplexed fiber optic systems. This work has involved both experimental measurements and the development of numerical modeling methods for high capacity fiber links. His work has also involved the development of all-optical switching and clock recovery techniques. He is the author of a number of papers, book chapters, and the book Engineering Electromagnetics (New York: Prentice Hall, 1998) Dr. Demarest is a member of Eta Kappa Nu, the Institute of Electrical and Electronics Engineers (IEEE) and the International Union of Radio Science (URSI) Commission B.
Ph.D., Ohio State University, 1980. M.S.E.E., Ohio State University, 1976. B.S.E.E., John Brown University, 1974. Circuits, Fiber optic engineering, Electomagnetics, Microwave systems, Noise reduction in electrical systems, Antennas, Radar engineering, Laser engineering. Computational electromagnetic techniques, Lightwave systems, antennas. Electromagnetic Fields (EMF) Advisory Committee, IEEE, Kansas Electric Utilities Research Program (KEURP), URSI Commission B.